The S&P/TSX Composite Index bucked the North American trend yesterday, registering a modest gain that left it within 52 points of its record close, and that’s despite hefty losses for pot stocks after Aphria reminded us legalization is not a guarantor of profitability. 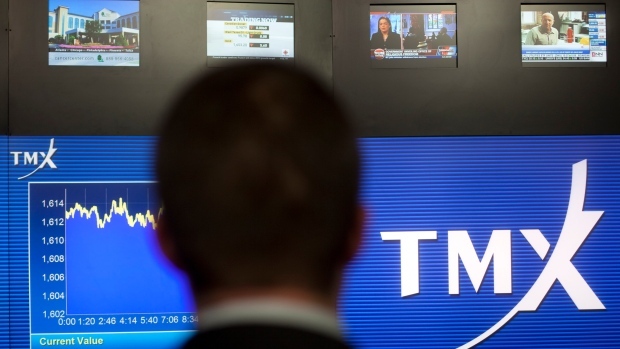 We’ll continue tracking the TSX’s steady march toward uncharted territory. We’ll consider the stakes for the provincial economy, the spillover effect for the rest of the country, and the implications for federal-provincial relations. We’ve got BNN Bloomberg's Tara Weber live on location from a polling station in Calgary, and we’ll have plenty of energy industry perspective this morning from executives attending the CAPP Symposium in Toronto. Economist Benjamin Tal is out with a report this morning that argues for regulators to revisit the B-20 mortgage stress test that took effect at the start of last year. Although he points out it's impossible to determine how much of the slowdown in once-hot markets is due to B-20, he notes alternative lenders have been making gains in its wake, and argues credit quality was already improving before it was imposed. VANCOUVER HOUSING "LIKE A CANDY STORE FOR BUYERS"
-We’re seeing a trend in U.S. bank earnings season, with capital markets proving to be a weak spot. Bank of America reported a 22 per cent plunge in equities trading revenue for its fiscal first quarter this morning. Nonetheless, overall net income hit a record of more than US$7 billion. -The pictures are the story in Paris after the fire that ripped through Notre Dame Cathedral. President Emmanuel Macron has vowed to rebuild the historic site. Meanwhile, Bloomberg News notes a pair of fashion industry icons are pledging 300-million euros to support reconstruction. -Canadian National Railway said last night it will appeal a Canadian Transportation Agency ruling that it breached service obligations last year by denying wood pulp shipments “rather than making every reasonable effort” to address rail traffic congestion in Vancouver. -The Ontario Securities Commission has declined to intervene in Mangrove’s battle with TransAlta over a proposed investment by Brookfield. Next up, the Alberta Securities Commission will deliver a decision on the activist’s request for leave on Thursday.